August started strong, but then I stumbled for a couple weeks in terms of reading. I just wasn’t motivated to dive into (or finish) anything. Distressingly, I set two titles aside for later — not quite giving up, but waiting for a better time. In better news, I did complete by Dusting Off The Bookshelf challenge — more to come on that this week. So wonderful and quirky and unexpected. Black comedy at its best. I am ashamed that I have not gotten around to writing the review this book deserves. I am very sad to have completed this book, as it is the last in Bradley’s 6-book Flavia de Luce series. I have truly adored each and every installment in the series and The Dead in Their Vaulted Arches is no exception. This is the only one, however, that I don’t think would stand alone without reading the preceeding novels. This finale ties together many outstanding questions left from the 5 murders Flavia has “solved” in her 11th year. I listed the audio versions of all these books except the first. Jayne Entwistle does a magnificent job bringing these books to life. Not my typical read at all — a collection of comedic illustrated essays — but I had heard really great reviews from readers I trust. And I’m glad I snapped my mini-reading funk with this book. I read this in one sitting with no problem. Fast-paced, acerbic humor (as in I was laughing out loud at the pool) balanced with heartbreaking honesty. I recognized myself several times throughout. It’s really good read. Despite my “advanced age,” I love that the YA fiction genre really coming into its own, filled with great characters, sharp writing and high emotion. We Were Liars has all of these qualities, plus some additional twists and turns. It just didn’t quite reach the level of an overall great read for me. Wounded and vulnerable and misunderstood teenagers make for great books. I just never quite fell in love with this set the way I think I was supposed to. The other problem here is that I predicted the central plot twist very early on in this novel. Perfectly pleasant, very readable, likable characters, good story, interesting setting. Nothing earth shattering here but I can never go wrong reading Anna Quindlen. The Rise & Fall of Great Powers: Good book, bad narrator. Set aside the audio 25% in. Must get print version. 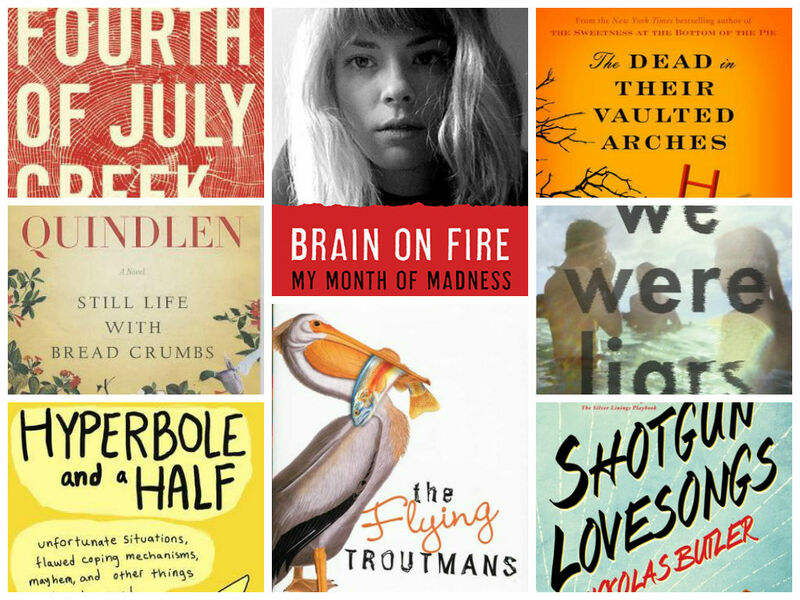 My August Photo Collage is comprised of book covers uploaded from Goodreads.